Kyoto Cross Media Experience 2009 (Kyoto CMEX) was held September 26th to October 4th in Kyoto. This was the first regional program of Japan International Contents Festival (Japan CoFest). Theme in 2009 was “Long-lasting and state-of-the-art Japanese content”. 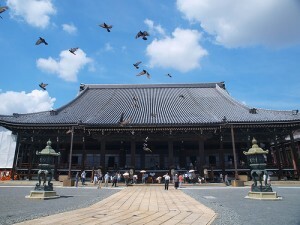 Several movie studios, a temple, schools in Kyoto were used as the venues. There were movie showing, cosplay parade, Manga exhibition, CG anime contest, and so on. One of the most featured events was the Nintendo Game Event that was held on October 3rd and 4th. Before it opens on the first day, there was a long line of people waiting to get in and download special contents for DS. Nintendo distributed Pikachu for all DS versions of Pocket Monster, Kiiro no Mori course for the poke walker, and Mario & Sonic at Vancouver Olympic game trial. Special photo frame designed Mario and Princess Peach in kimono for DSi.